Closing rural schools not only changed small communities but also eliminated the profession of country teacher. Most of the educators who kept order in one-room country schools in the early l900s were young women. Enthusiastic, adaptable and competent, they were respected in the neighborhood and eagerly sought as wives by local bachelors. Nothing caused such improvement in the appearance of the male population as the arrival of the new teacher. Often the teachers were country girls themselves; a good thing because two years at teacher's college, their usual training, couldn't enable them to cope as well as they did with storms, outhouses and pupils who disappeared from class in haying season. Muriel Scheltens was one of those teachers. 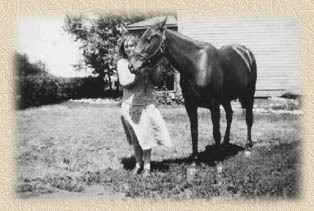 In autumn 1932 eighteen-year-old Muriel saddled her favourite horse, Nimbo, eager to start her first job as a teacher in Galahad, Alberta. A clever young woman, Muriel had graduated from high school at sixteen, them completed two years of Normal School, the teacher's college at Camrose, Alberta. She was looking forward to helping out her family in those desperate depression years. Muriel's first school was the Rosewood School in Galahad. She eventually taught in the Sunrise School District, near Sedgewick, Alberta, in Jarrow and in the Agricola school. And, it's a good thing she liked horses. She seldom lived close enough to school to walk or, in winter, ski, to class. In depression era Alberta just the well-to-do owned cars. Horses were the only practical way of traveling to somewhere too far to walk. Winter and summer Muriel commuted to work on horseback. Her pupils rode to school as well, from surrounding farms and ranches. Just as schools today have parking lots to accommodate vehicles, country schools in the Canadian West provided sheds or stables to shelter teacher's or pupil's horses during class hours. Being responsible for her horse and tack was a normal part of Muriel's working day. Fortunately she came from horse owning people. Her mother, Amanda Vick, had participated in cattle drives and branding on the Vick cattle ranch in North Dakota. (The KV brand is still registered in N.D.) Her father, Charlie Scheltens, was an Alberta rancher and grain buyer. Horses were part of the family. Muriel's preferred horse, Nimbo, was good-natured with a comfortable gait, no small consideration on those daily journeys, which could be as much as eight miles. Occasionally she had substitutes. Once when Nimbo was lame, she borrowed a big, raw-boned roan from a neighbor. It took no interest in either education or its rider's wishes. Its sole desire was to get home and eat grass. It would take the bit between its teeth and gallop off full tilt down the road, especially on the homeward trip. Another equine replacement, a small Indian cayuse, was skittish and hard to ride. Muriel persevered, teaching the horse to pace for a smoother ride. Since the Scheltens lived in Wainwright, Muriel, and her horse, were obliged to board. In this way they became part of the rural community. Some of the families they stayed with, no doubt struggling in the tough economic times, were quite frugal. She remembers one Scottish family depending greatly on oatmeal porridge. The teacher, of course, ate what the family ate. The total number of pupils in a one room country school could vary from six to twenty and included grades one through eight, though there might be only one or two pupils in each grade. The teacher was expected to prepare lessons for all levels. Because she'd lived in small prairie towns herself, Muriel understood these children and often tolerated unusual behavior. One of her best-remembered students was a little girl who loved animals and had befriended an injured owl. When it was healed, she frequently brought it to school where it sat quietly on her desk, its head swiveling as it observed the classroom. Many of the boys missed classes to help out at home with planting or harvesting. To practical Westerners the crops were more important than learning the capital cities of Europe. Consequently, Muriel was sometimes barely a year older than the tall farm boys she was teaching. In spite of her youth and her 5'4" height, Muriel's strong personality and firm discipline prevailed. An eighteen year old who could handle a cayuse wasn't about to be daunted by a farm kid, no matter how tall he was. Teaching was just part of her daily duties. Those were the days of big barrel wood stoves, blackboards, gas or coal oil lamps, and water buckets, complete with dipper, in the cloakrooms. 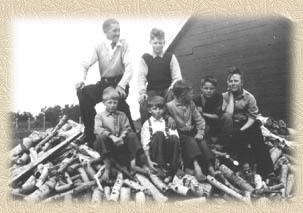 Some of the fathers might deliver wood or haul water, but it was the teacher's job to make sure the fire was kept burning - a critical task in non-insulated wooden schools, where snow blew through the cracks on windy winter days. One school, located near a natural coal seam, actually had the luxury of coal for the fire. Muriel's first priority was satisfying the stern school inspector during his random and unannounced visits that her pupils were learning. But, it didn't end there. Raising and lowering the flag each day, with suitable ceremony, was supervised by the teacher. Casting the Xmas concert so each pupil, no matter how shy, had a part? The teacher's problem. Drying off wet mittens and coats after recess so they'd be warm enough to wear home when school was out? The teacher's responsibility. Deciding if a storm was so severe that students should be kept at school till their parents came for them? Up to the teacher. The teacher in rural Canada was a combination of educator, custodian, and weather forecaster, who also could ride. Between coping with the vagaries of weather and getting the wood split, they taught the classics of English literature, gave their pupils a firm grounding in grammar and mathematics and, by example, showed the discipline required to succeed in life. No wonder they were so sought after as wives! But, Muriel didn't marry one of her local swains. In l936 her father died suddenly. She was forced to give up teaching and move with her family to Lac La Biche where they started a mink farm to make a living. She was part of the era of adventurers and bush pilots who opened up the Canadian North. During the Second World War Muriel worked for the U.S. Army Corps of Engineers, just one of the many jobs she held. In Lac La Biche she met and married Art McLaren, a sawmill owner. After a series of moves they settled, with their two children in Kamloops B. C. where Muriel now lives in a nursing home. Yet, all her life Muriel remained a true teacher, sharing her knowledge of music, her love of nature and her passion for astronomy. Many a novice stargazer was first introduced to the heavens as Muriel pointed out the constellations, which first fascinated her as a young teacher riding home under the dark, glistening prairie sky.